Waterford Airport has come on board to support The Kilkenny Arts Festival, which takes place this August 6th-15th. Internationally acclaimed, this annual cultural extravaganza will showcase over 240 exciting events, across 10 days. This new partnership sees the festival announce Waterford Airport as its official Airport partner. Aer Arann operates eighteen flights per week to and from London Luton, five times return flights to/from Manchester, four times return flights to Birmingham, return flights to Galway six days each week and twice weekly return flights to Lorient, France over the summer direct from Waterford Airport. Now in its 37th year, the festival attracts visitor globally with more than 23,000 people expected to flock to the Marble city for the 10 day festival, featuring the very best in Irish and international visual art, classical music, theatre and dance, jazz, world and traditional Irish music, literature, film, craft and children’s events. Graham Doyle, CEO, Waterford Airport, commented that the partnership with Kilkenny Arts fits well with the facility’s role as a key piece of regional transport infrastructure in the Southeast, furthering the opportunity for the Kilkenny Arts Festival to draw from an international audience. Kilkenny Arts Festival and Waterford Airport are pleased to announce the arrival of their new partnership, announcing Waterford Airport as the festival’s official Airport partner. 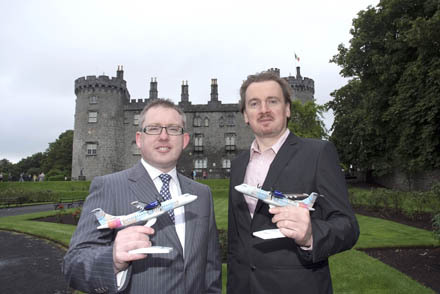 Pictured here are, Graham Doyle, CEO, Waterford Airport and Damian Downes, CEO, Kilkenny Arts Festival.